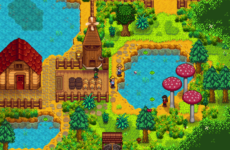 CD Projekt Red’s flagship title, The Witcher 3: Wild Hunt (Game of the Year for 2015) is a well-known and extremely respected game that is highly praised game critics everywhere. In Witcher 3: Wild Hunt, there is a little sidequest where players can challenge Non-Playable Characters (NPC) to collect cards through a mini-game. This addictive mini-game is known as Gwent. What is Gwent? 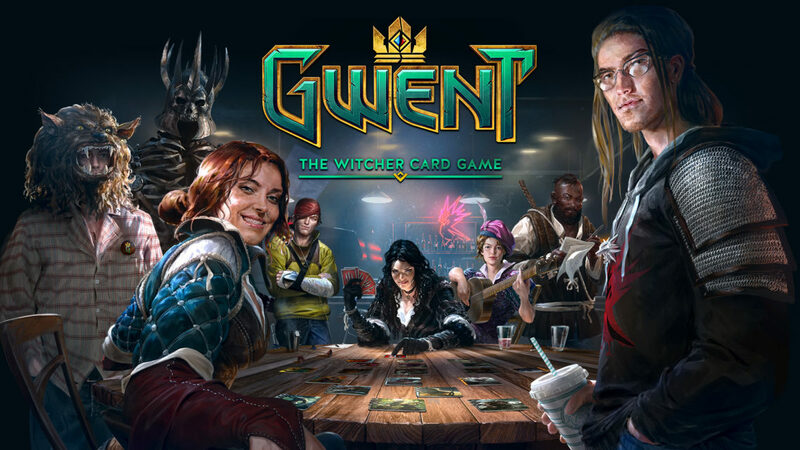 The Gwent mini game was so well received that the developer CD Projekt Red decided to green light a stand-alone Digital Card Game with the same name and concept. Of course, with a little bit more depth and strategy this time around. Thus, Gwent: The Witcher Card Game was born. Gwent is a two player game where players will try to amass an army on their side of the board to out-muscle the opponent’s army. Each card is either a unit or a special card. Units have stats such as base strength and some of them have abilities, while a special card is a one-time use spell card. The first player is decided by a coin toss and each player take their respective turns to play either a unit or a special card from their hand until there are no cards to be played or both players pass their turn back to back. 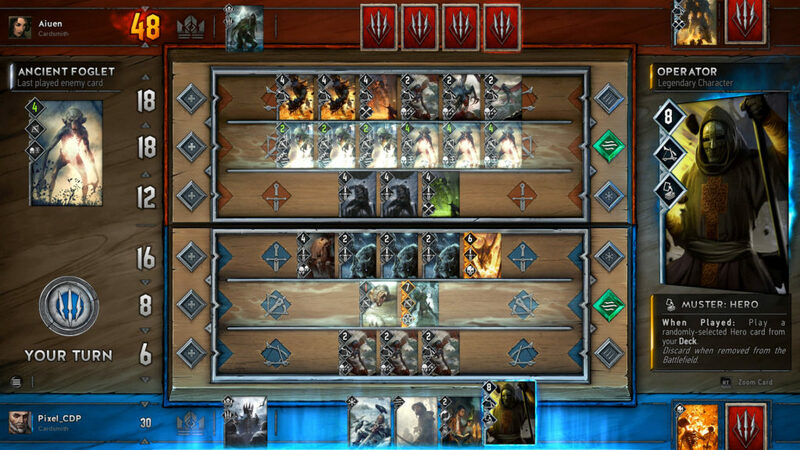 Gwent plays over three rounds, and the player that out-matches the opponent in a best two out of three format wins the game. The games are simple and easily learnt by new comers. The rules are mostly similar to a chess game where one player will play their piece and then the other player will play their piece next, resulting in a turn based game play to determine the victor. So, you are a new player that is up for some Gwent, so what can you expect diving in? 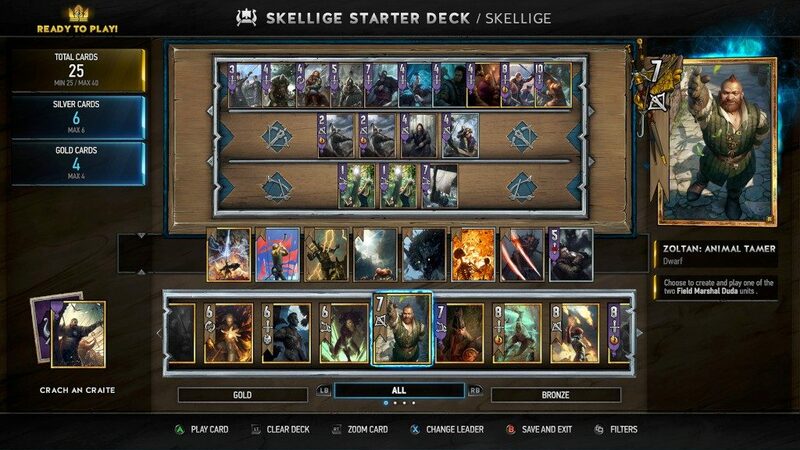 All new players will receive basic cards to make a deck from all five different factions from the pirates of Skellige, the southern empire Nilfgaard, the elves and dwarves of Scoia’tael, the alliance of the Northern Realms and the humongous Monsters faction. Each faction has its own unique faction ability, play-style and their own leaders, each with a different skill set. Every player will have enough cards to build a deck in the faction that they like. The cards are divided into three classes; gold, silver and bronze, with each of these classes having four different rarities, namely common, rare, epic and legendary. 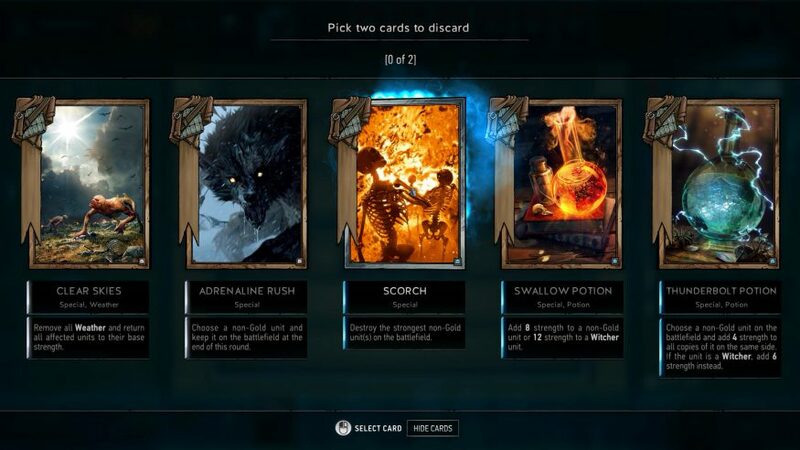 The classes affect deck building but the rarities do not, only the frequency of the card appearing when you buy kegs (Gwent’s equivalent to card packs). I won’t go into detail about the deck building aspect as the tutorials cover most of them well when you first play the game. The learning curve for new players is relatively low but with a high ceiling of more in-depth strategies. As a new player, you can learn the game through the tutorial and understand it perfectly and from there, pick up a deck from a faction you like, start playing and win games. However, as you play more of Gwent, you will learn more and start to appreciate the more intricate stratagems of the game. The rewards system is also player-friendly whereby a player only needs to win 6 rounds to win a keg. Yes, 6 ROUNDS (not games), where each game has 3 rounds and you can win up to 2 rounds, in other words you only need to win a total of 3 games to have a keg. But it doesn’t stop there, because for each 2 rounds you win, you also gain small rewards such as 5 ores (the in game currency), 5 scraps (to craft cards) or a random card that could be from any rarity. You are also further rewarded for each level you gain and each rank you attain in the ranked matches mode. These rewards can range from kegs, to large amounts of ores or even legendary cards. The one aspect of the game that is lacking hard is the crafting system, which allows you to destroy or mill a card you own for scraps to craft another card you need. It acts like the crafting system of any other card game but the price of crafting a card is extravagant. For instance, a legendary cards costs 800 scraps to craft but it only mills down to 200 scraps. In other words, you need to mill 4 legendary cards to craft one new legendary card. Still, this does not impede a new player’s progress as the amount of cards, ore, scraps and kegs you get from the reward system is lucrative enough that you will have a decent competitive deck after a few days of play. So what sets Gwent aside from other digital card games out there? The first difference is the absence of costs or resources to play cards. Most games tends to have resources or costs to play a card such as mana stones in Hearthstone, lands in Magic the Gathering and other forms in other card games. The only resource in Gwent is the cards you have in your hand. This is where the depth and strategy of the game is. Since the only resource you have are the cards you play each turn, each play becomes crucial and a single mistake can cost you the game. Still, it does not punish new players and veteran players alike. Each loss teaches the player to be better and each win rewards the player with a better understanding of the game play and their cards. Another aspect of the game that is very defining is bluffing. For instance, there is a card in the game called Scorch, which kills the unit with the highest strength on the board, regardless whether it’s yours or not. The scenario is, your opponent just buffed a 6 strength unit on his side of the board to 10 strength with a special card. Now you have a choice, to either play the Scorch card in your hand to kill his newly buffed unit, or you can place an 11 strength unit on the board bluffing him that you are not holding any Scorch cards. This way, if he buffs the unit again to outmatch your 11 strength unit, you can play Scorch and set him behind three cards (a unit, a card that buffs and a second card that buffs again). This is just one of the many strategies and smart plays that can be executed in the game. 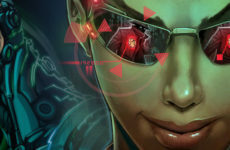 Each faction and each leader have their own play styles, which leads to good combinations of cards and replay ability. Most of the cards are designed to stand out and do different things so that they contribute to the deck in a variety of manners. Now, here comes the bad news. The game is still in closed beta with an open beta in the horizon (don’t quote me on this). There are many patch changes to the cards as the players and the game developers try to balance out the game before the open beta release. This could lead to swings in the metagame where one card could be so strong at one point, to being utterly useless in a month’s time. Still, you can scour the internet for the closed beta codes since it is being given away like Oprah Winfrey giving away gifts on her show. You can easily find one and start playing today. So, how about a game of Gwent then? 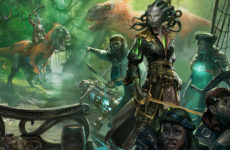 MTG FIX: Roaring into Ixalan!